Hello guys, hows everybody doing. I have a right rear bad wheel bearing on my 91' wagon and am thinking of doing a drum to disc conversion instead of replacing the bad bearing. There's a junkyard near me that has 2 or 3 92-93 EX sedans with the parts I need. Thing is, I found out that wagon trailing arm parts are different than sedan/coupes. They even have different size calipers and wheel bearings. I have heard people with wagons using the non-wagon parts but I am still concerned that the different non-wagon parts may make the car handle differently or be unsafe to drive, being that the wagon has a heavier rear end. So what should I do, get the non-wagon rear end disc conversion, or try to find a wagon with the exact same parts? I'm hoping someone with a lot of knowledge can help me out. I think possibly I can just use my wagon parts but I just don't know yet. Pics of all the parts I need for the swap (its a simple bolt on procedure). I've heard people report having a much great stopping power with rear discs, that's why i want to do it... and also cause I live where a lot of deer are and want all the stopping power I can get, its much safer that way. Last edited by mishakol129; 12-02-2013 at 02:44 AM. As a fan of disk brakes myself, I gotta say that ..umm.. drums will have about the same stopping power. Just a bit better in the overheating department which has nothing to do with a panic stop for a deer. If you still want it, I'd get wagon stuff for the suspension/brakes. Yeah thing is wagons are rare to find in the JY and rare in general. I mean, they're quite uncommmon. The majority of people (2 or 3) at the Cb7tuner forum said that they used non wagon rear suspension parts for the disc swap without any problems. Yet there was one guy there who said they were different and that you needed wagon knuckles. "Wagon knuckles are different than sedan coupe knuckles. So you either need EX wagon rear disc knuckles or an entire coupe/sedan rear crossmember/control arms/knuckles." "I used sedan rears. No problems so far." "I did this on my wagon and i got all of a 91 SE 4 Door. 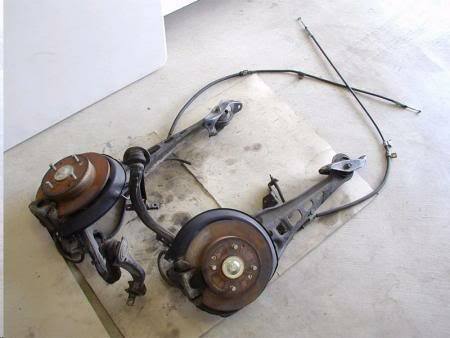 I got the trailing arm and the knuckles, and ebrake cables. All bolted up real easy no problems." I looked for more answers to this question but non seems to answer the question more in depth than this. Last edited by mishakol129; 12-03-2013 at 01:18 AM. Well, I don't REALLY know the answer firsthand. I was thinking about the heavier weight of the wagon rear end; as far as front/rear brake balance and also for spring-rates.